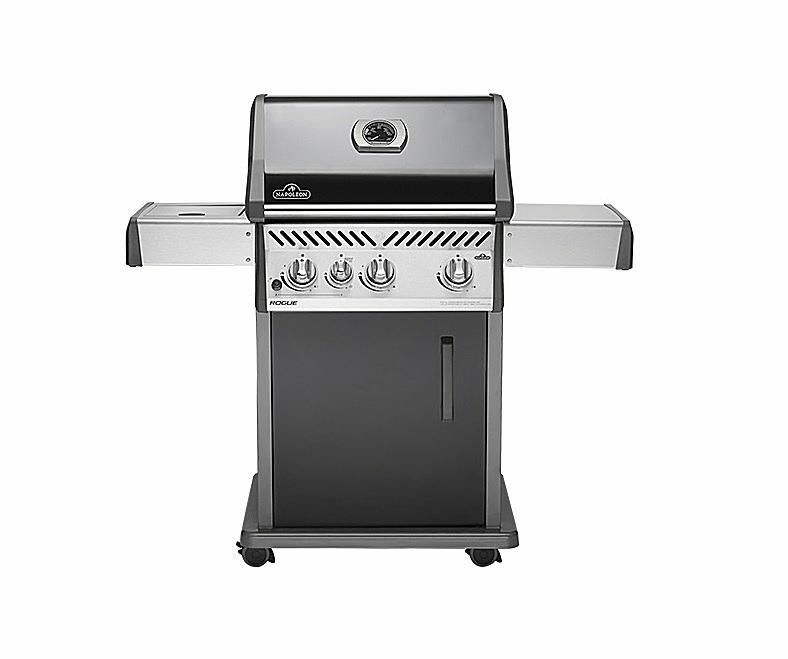 The Napoleon Rogue 425 Gas Grill is a basic, relatively expensive gas grill similar in many ways to the Weber Genesis. Manufactured in Canada by Napoleon, this is a high-quality grill that is built to last and cook with even heat and provide a good deal of versatility. The heat output of this model is low and previous Napoleon owners have complained that this grill simply can't reach the kind of temperatures of its more expensive cousins. While relatively low powered for a Napoleon, this gas grill is comparable to similarly priced and sized products from Weber. In 2016, Napoleon introduced the Rogue line of gas grills. Designed to be compatible with the same features found on their more expensive Prestige line, this gas grill has all the versatility that you would expect to find from Napoleon's great line of grills. This unit is slightly smaller than the prestige grills with 425 square inches of primary grilling space versus the 500 square inches found on that line. The three burners turn out a maximum of 36,000 BTUs, which is generally on the low side, especially considering Napoleon's history for high heat output. This limited power is this grill's biggest drawback. Even the side burner has only 9,000 BTUs, a small number in the industry these days. The reason that the standard side burner output is low is that it is available with an infrared side, which only needs this kind of heat for intense searing. Of course, it still contains all of the Napoleon features that make these great grills. At the heart of any good gas grill is the cooking system. The Napoleon's high-quality stainless steel burners produce an even temperature while the porcelain coated cooking grates in the wave pattern give excellent heat contact. The grates in this grill are the real strong point. Heavy, reversible, and able to take punishment, they can transfer heat efficiently to foods for good searing, even with the lower heat output of the grill. This model comes in a variety of configurations including stainless steel models as well as options for an infrared side burner or no side burner. It is compatible with all of Napoleon's accessories including their cast iron charcoal baskets which allow this gas grill to be converted into a charcoal grill. This is a unique feature that you do not find on similarly priced grills.